According to the Stealth Media Group website, principal photography for this new film is set to begin October 14, 2013. The cast now includes: Andrea Risborough, Robert Sheehan, and Gabriel Byrne. Benedict Cumberbatch is apparently no longer attached to this project. The director is Terence Ryan (The Brylcreem Boys, Puckoon) and the writers are Susan Morrall (The Brylcreem Boys) and James T. Ryan. The setting of the story is Ireland and it is assumed filming will be in Ireland, but there is no confirmation about this, as there is no confirmation in the press about this project. All we can do at this time is stay tuned and see if this project gets off the ground! I wasn’t going to make a post about this because from what I can tell this project is not confirmed yet. But I’ve noticed that links are making a stir on twitter (and tumblr) so I’m putting this here for the record, even though I wanted to wait until there was something official to post about! Stealth Media Group are listing a movie named Consequences, starring Benedict Cumberbatch with Robert as the second-listed cast member. It lists the movie as pre-production, and I’ve heard that the poster was on display at the Cannes Festival. The poster itself is made using a Photoshopped picture of Benedict from Parade’s End. I’m making this post purely to say that I will not be adding this movie to Robert’s current projects list or posting about it any more until there is solid information on it, as I believe it was at Cannes to try and hook buyers and the movie is not confirmed yet. I simply wanted to reference it because of the buzz on social networks. Several people have already noted that a film in pre-production in June is never going to be ready for release in Winter 2013, so I am inclined to agree with MC. I will be noting now that this film is “unconfirmed” and we shall see if anything official pops up. 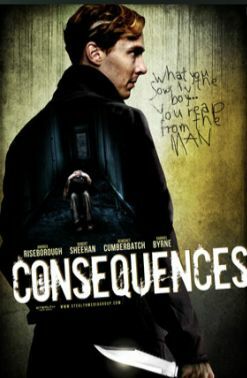 Stealth Media Group has announced a new film in its roster: Consequences, starring Andrea Risborough (WE, Wallis Simpson, Made in Dagenham), Robert Sheehan (Killing Bono, Season of the Witch), Gabriel Byrne (End of Days, The Usual Suspects), and Benedict Cumberbatch (War Horse, Atonement, Tinker Tailor Soldier Spy, Sherlock Holmes TV series). The film is in pre-production now and is scheduled to premiere in Winter 2013. I am assuming it is being filmed in Ireland and I hope to verify that soon. Also, no word on exact roles yet, but that should be available soon, too. Synopsis: A hard-hitting drama based on a true story of a young woman who must deal with the devastating effects of having a serial killer for a brother. The film is directed by Terence Ryan, who worked with Gabriel Byrne on The Brylcreem Boys, and is written by Susan Morrall, who wrote The Brylcreem Boys, and James T. Ryan. It is described as a “hard-hitting drama” and the (tiny) poster indicates that! I guess there is no hope whatsoever of Gabriel Byrne taking a vacation this summer! The first sentence of the logline reminds me of a thing Gabriel often said in interviews concerning the recruit of boys in the catholic chcurch ;-) and I also found this synopsis on cinando.com “Anne Marie saw herself as a single mother living in rural West Ireland. Everything in her life seemed ordinary. That was until the day Brendan O’Donnell came to her flat and threatened her and her baby with a knife. Before leaving he threatens to cut her face so that every time she looked in a mirror she would see him. He was her brother. Anne Marie has Brendan sectioned. He is arrested and committed to the psychiatric hospital. But within a week the doctors release Brendan, and within the year he has killed three people.